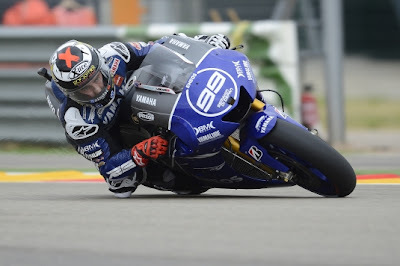 Yamaha Factory Racing rider Jorge Lorenzo emerged the victor in an intense qualifying battle today, securing the pole position for tomorrow’s Grand Prix of Aragon at the Motorland circuit. The Championship leader started the first dry session of the weekend quite slowly, gradually picking up the pace to join the battle between his team mate Ben Spies, Cal Crutchlow and Dani Pedrosa for the top spot. It was with his last fresh tyre just three laps from the end of the session that Lorenzo delivered, putting down a 1’49.404 lap to secure pole 0.088 seconds ahead of Pedrosa. The pole is his fifth of the season. Texan Spies threatened to make it an all Yamaha front row this afternoon, consistently battling with the top three and briefly taking the top spot on the timesheets. His fastest lap came just one lap before the end of the session, delivering a 1’49.748 lap and missing the front row by just 0.172 seconds.